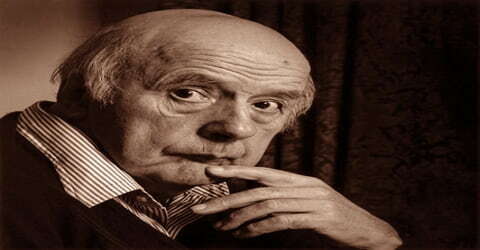 John Betjeman – English poet, writer, and broadcaster. 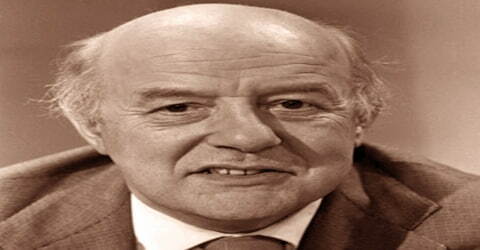 John Betjeman was an English poet, writer, and broadcaster who was born August 28, 1906, London, England. He was the most popular English poet of the 20th century and a familiar personality on British television. A sensitive, lonely child, he knew early that he would grow up to forswear the family business in favor of poetry. The son of a prosperous businessman, Betjeman grew up in a London suburb, where T.S. Eliot was one of his teachers. He later studied at Marlborough College (a public school) and Magdalen College, Oxford. The years from early childhood until he left Oxford were detailed in Summoned by Bells (1960), blank verse interspersed with lyrics. Betjeman’s first book of verse, Mount Zion, and his first book on architecture, Ghastly Good Taste, appeared in 1933. Churches, railway stations, and other elements of a townscape figure largely in both books. Four more volumes of poetry appeared before the publication of Collected Poems (1958). His later collections were High and Low (1966), A Nip in the Air (1974), Church Poems (1981), and Uncollected Poems (1982). Betjemen’s celebration of the more settled Britain of yesteryear seemed to touch a responsive chord in a public that was suffering the uprootedness of World War II and its austere aftermath. Sir John Betjeman was born on August 28th, 1906, near Highgate, London. He was the son of a prosperous silverware maker of Dutch descent. His parents, Mabel (née Dawson) and Ernest Betjemann, had a family firm at 34–42 Pentonville Road which manufactured the kind of ornamental household furniture and gadgets distinctive to Victorians. 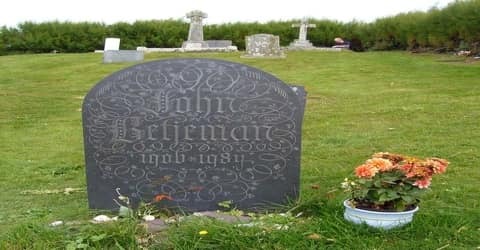 The family name was Betjemann, with two ‘n’s, but John dropped the second ‘n’ during the First World War, to make the nameless German. John was an only child, and by all accounts had a lonely childhood, taking comfort from his teddy bear, Archibald, later to feature in his children’s story, Archie and the Strict Baptists. He was baptized at St Anne’s Church, Highgate Rise, a 19th-century church at the foot of Highgate West Hill. The family lived at Parliament Hill Mansions in the Lissenden Gardens private estate in Gospel Oak in north London. John attended prep school at Highgate, London, where one of his instructors was a recent American arrival, T. S. Eliot, who proved unresponsive to the 10-year-old’s poetic efforts. During his tenure at Dragon School, Oxford (1917-1920), Betjeman developed an abiding interest in architecture; he next attended Marlborough public school in Wiltshire, which he was to remember chiefly for its bullies. Throughout John’s childhood, his family went for holidays to Trebetherick in Cornwall, where his father owned a number of properties. These seemed to have been the happiest times for JB, and are remembered in many of his poems. He entered Magdalen College, Oxford, in 1925 and favorably impressed the great classics scholar C. M. Bowra with his knowledge of architecture, but negatively impressed his famous tutor C. S. Lewis by his academic indifference. At Oxford he struck up a lasting friendship with Evelyn Waugh and may even have served as a model for one or more of the characters in Waugh’s early novels; more importantly, Betjeman cultivated at Oxford a strong aversion to sports and an equally strong inclination towards esthetics. He left Oxford in 1928 without a degree. On 29 July 1933, he married the Hon. Penelope Chetwode, the daughter of Field Marshal Lord Chetwode. The couple lived in Berkshire and had a son, Paul, in 1937, and a daughter, Candida, in 1942. Betjeman’s sexuality can best be described as bisexual, and his longest and best-documented relationships were with women, and a fairer analysis of his sexuality may be that he was “the hatcher of a lifetime of schoolboy crushes – both gay and straight”, most of which progressed no further. Nevertheless, he has been considered “temperamentally gay”, and even became a penpal of Lord Alfred ‘Bosie’ Douglas of Oscar Wilde fame. Betjeman’s wife Penelope became a Roman Catholic in 1948. The couple drifted apart and in 1951 he met Lady Elizabeth Cavendish, with whom he developed an immediate and lifelong friendship. Betjeman had a poem published in Isis, the university magazine, and served as editor of the Cherwell student newspaper during 1927. His first book of poems was privately printed with the help of fellow student Edward James. He famously brought his teddy bear Archibald Ormsby-Gore up to Magdalen with him, the memory of which inspired his Oxford contemporary Evelyn Waugh to include Sebastian Flyte’s teddy Aloysius in Brideshead Revisited. Much of this period of his life is recorded in his blank verse autobiography Summoned by Bells published in 1960 and made into a television film in 1976. In 1934 he became film critic for the Evening Standard but was fired less than a year later for his overly enthusiastic reviews. Betjeman’s second volume of verse, Continental Dew: A Little Book of Bourgeois Verse (1937), is undistinguished but for its foreshadowing of an attitude that was to fully surface in subsequent books: a deep-dyed distrust of “modernity” in all of its guises its indifference to tradition, its runaway materialism, and its savaging of the landscape. He worked briefly as a private secretary, school teacher and film critic for the Evening Standard, where he also wrote for their high-society gossip column, the Londoner’s Diary. He was employed by the Architectural Review between 1930 and 1935, as a full-time assistant editor, following their publishing of some of his freelance work. Timothy Mowl (2000) says, “His years at the Architectural Review were to be his true university”. At this time, while his prose style matured, he joined the MARS Group, an organization of young modernist architects and architectural critics in Britain. Betjeman’s book titles and sub-titles are frequently thematic, as in his first book on architecture, Ghastly Good Taste: a depressing story of the rise and fall of English architecture (1933); it was followed by University Chest (1938) and then Antiquarian Prejudice (1939), which defines architecture for Betjeman as not mere building styles but as the total physical environment in which life is lived. His topographical writings, which celebrate actual places he loved and excoriate places he loathed, include Vintage London (1942), English Cities and Small Towns (1943), and First and Last Loves (1952). In 1937, Betjeman was a churchwarden at Uffington, the Berkshire village (in Oxfordshire since boundary changes of 1974) where he lived. That year, he paid for the cleaning of the church’s royal arms and later presided over the conversion of the church’s oil lamps to electricity. The Shell Guides were developed by Betjeman and Jack Beddington, a friend who was publicity manager with Shell-Mex Ltd, to guide Britain’s growing number of motorists around the counties of Britain and their historical sites. They were published by the Architectural Press and financed by Shell. By the start of World War II, 13 had been published, of which Cornwall (1934) and Devon (1936) were written by Betjeman. A third, Shropshire, was written with and designed by his good friend John Piper in 1951. 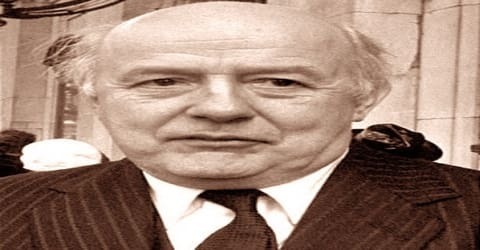 During World War II Betjeman served variously as United Kingdom press attaché to Dublin, as BBC broadcaster, and in the British Council books department. In this period he issued two volumes of verse that revealed him to be a serious poet and not a mere “versifier”: Old Lights for New Chancels (1940) and New Bats in Old Belfries (1945). 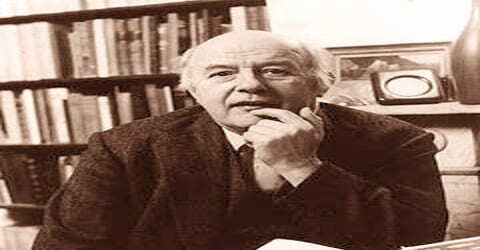 Although they share with most modern poetry a profound pessimism about life, these works established Betjeman as a distinctive voice and somewhat of an anomaly: in an age dominated by lyric-contemplative verse, Betjeman relied strongly on narrative, or at least anecdotal, elements; in an age of free verse, he wrote in tight metrical and stanzaic forms; in an age of poetic obfuscation, Betjeman, though not without his ambiguities, was accessible; in an age of tight Classical control of emotion, he was wistfully playful and even sentimental. In short, Betjeman was a throwback to the best-loved poets of English verse tradition to Tennyson, Hardy, and Kipling. Betjeman wrote a number of poems based on his experiences in “Emergency” World War II Ireland including “The Irish Unionist’s Farewell to Greta Hellstrom in 1922” (written during the war) which contained the refrain “Dungarvan in the rain”. The object of his affections, “Greta”, has remained a mystery until recently revealed to have been a member of a well-known Anglo-Irish family of Western county Waterford. His official brief included establishing friendly contacts with leading figures in the Dublin literary scene: he befriended Patrick Kavanagh, then at the very start of his career. Kavanagh celebrated the birth of Betjeman’s daughter with the poem “Candida”; another well-known poem contains the line Let John Betjeman call for me in a car. In the 1950s Betjeman continued to write prolifically on architecture and topography, produced a book of verse A Few Late Chrysanthemums (1954), and did a year of BBC broadcasts (1957). Most important, he published his Collected Poems (1958), which was a huge seller, an astounding fact considering normal public indifference toward poetry and the consequent well-known indigence of almost all poets. His popularity was enhanced by a blank-verse autobiographical poem, Summoned by Bells (1960), a quiet, introspective account of his first 22 years, and by two more verse collections, High and Low (1966) and A Nip in the Air (1975). 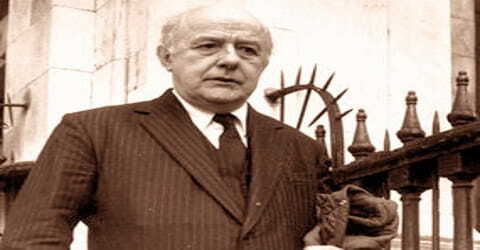 Sandwiched between, in 1969 Betjeman was knighted and in 1972 he was appointed Poet Laureate of Britain. In 1973 he made a widely acclaimed television documentary for the BBC called Metro-Land, directed by Edward Mirzoeff. On the centenary of Betjeman’s birth in 2006, his daughter led two celebratory railway trips: from London to Bristol, and through Metro-land, to Quainton Road. In 1974, Betjeman and Mirzoeff followed up Metro-Land with A Passion for Churches, a celebration of Betjeman’s beloved Church of England, filmed entirely in the Diocese of Norwich. In 1975, he proposed that the Fine Rooms of Somerset House should house the Turner Bequest, so helping to scupper the plan of the Minister for the Arts for a Theatre Museum to be housed there. In 1977 the BBC broadcast “The Queen’s Realm: A Prospect of England”, an aerial anthology of the English landscape, music, and poetry, selected by Betjeman and produced by Edward Mirzoeff, in celebration of the Queen’s Silver Jubilee. Betjeman was fond of the ghost stories of M.R. James and supplied an introduction to Peter Haining’s book M.R. James – Book of the Supernatural. He was susceptible to the supernatural. Diana Mitford tells the story of Betjeman staying at her country home, Biddesden House, in the 1920s. She says, “he had a terrifying dream, that he was handed a card with wide black edges, and on it, his name was engraved, and a date. He knew this was the date of his death”. In a 1962 radio interview, Betjeman told teenage questioners that he could not write about ‘abstract things’, preferring places, and faces. Philip Larkin wrote of his work, “how much more interesting & worth writing about Betjeman’s subjects are than most other modern poets, I mean, whether so-and-so achieves some metaphysical inner unity is not really so interesting to us as the overbuilding of rural Middlesex”. Betjeman was knighted in 1969, and in 1972 he succeeded C. Day-Lewis as poet laureate of England. 1973 Honorary Member, the American Academy of Arts and Letters. 2011 Honoured by the University of Oxford, his alma mater, as one of its 100 most distinguished members from ten centuries. Poor health curtailed Betjeman’s writing efforts in his later years, but what energies he had were dedicated to his continuing campaign for the preservation of historic buildings. 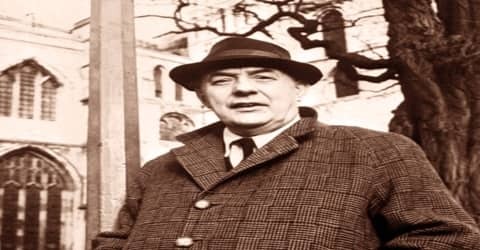 After suffering from Parkinson’s disease of a number of years, Betjeman had a stroke in 1981 and a heart attack in 1983. He died at his home in Trebetherick, Cornwall on 19 May 1984, aged 77 and is buried nearby at St Enodoc’s Church. A memorial window, Symbols of the Resurrection designed by John Piper, in All Saints’ Church, Farnborough, Berkshire, where Betjeman lived in the nearby Rectory. The Betjeman Millennium Park at Wantage in Oxfordshire, where he lived from 1951 to 1972 and where he set his book Archie and the Strict Baptists. 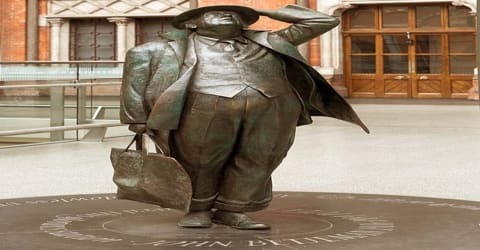 His public acclaim notwithstanding, Betjeman had his detractors among poets, critics, and scholars, many of whom found him shallow or facile and branded him a Tory traditionalist or an English provincial or a hopeless antiquarian. His defenders and admirers, however, included Edmund Wilson, W. H. Auden (who dedicated The Age of Anxiety to Betjeman), and Philip Larkin. One of the roads in Pinner, a town covered in Betjeman’s film Metro-Land is called Betjeman Close, while another in Chorleywood, also covered in Metro-Land, is called Betjeman Gardens. A road in the Sheffield suburb of Broomhill is called Betjeman Gardens. This suburb was described by Betjeman as ‘the prettiest suburb in England’ and was the subject of his poem ‘An Edwardian Sunday, Broomhill, Sheffield’.